The first stage of Cambodia’s Case 002 is over. But will Hun Sen stamp out the prospects of more people being held to account? The courtroom on the dusty outskirts of the Cambodian capital may have been hosting what has been described as ‘the most important trial in the world.’ But the sheen is already coming off a case aimed at holding to account four accused of being closely involved in the deaths of more than 2 million people during the Khmer Rouge’s reign in the 1970s. Now, it appears UN court staff may be bowing to this political meddling, raising uncomfortable questions for a court that was established in part to combat Cambodia’s culture of impunity. Under the court’s procedural rules, modelled on the French civil law system, prosecutors make initial submissions to a pair of judges who then make a decision on whether to indict or dismiss a case after conducting an investigation. 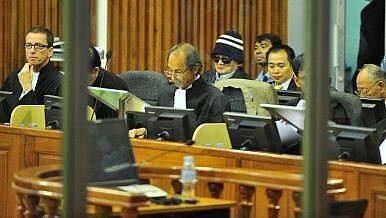 The court’s foreign prosecutors made submissions in Cases 003 and 004 in 2009 – notably without the support of their Cambodian counterparts – and in April, the judges announced the conclusion of investigations in the third case. While the suspects’ names remain officially confidential, court documents reveal them as Khmer Rouge navy commander Meas Mut and air force commander Sou Met, aging former cadres now living quiet lives after defecting to the government years ago. The judges provided scant public information about the investigation of these men during the roughly 20 months that it was open, leading court observers to question whether the case was being handled properly. With the announcement of the investigation’s closure – which came in a terse, late-afternoon press release on the Friday before a holiday weekend – those fears gained new urgency. In response, British prosecutor Andrew Cayley requested that the judges perform a series of additional investigative steps, as he’s permitted to do prior to a final decision from the judges on whether the case will go to trial. Among the steps Cayley said had yet to be taken were tasks so basic as to put the integrity of the original investigation into doubt. The investigating judges apparently made no effort to solicit complaints from victims during their probe, after hundreds gave statements in the first and second cases, nor did they conduct detailed investigations of a series of potential crime sites named by the prosecution. The suspects themselves weren’t even questioned. Cambodia has certainly endured its share of turbulent times. Its long-serving Prime Minister Hun Sen will soon go to the polls. The Diplomat profiles him here.